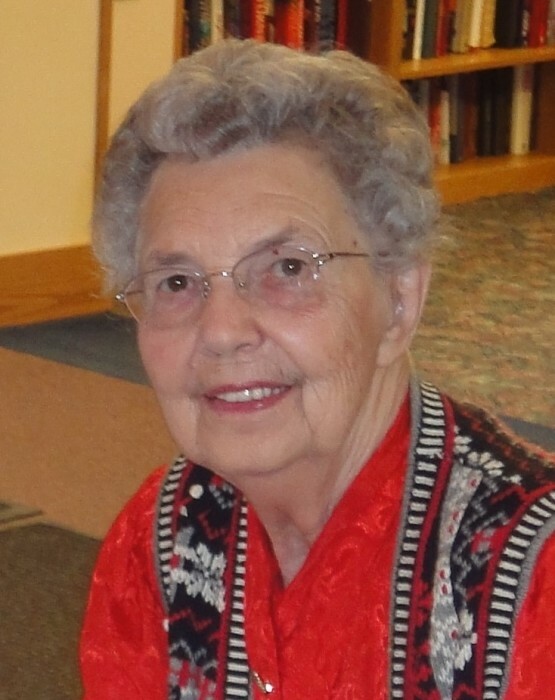 Darlene Goodwin, age 93 of Osakis, passed peacefully into her new life early Saturday, January 12, 2019, at Alomere Health in Alexandria, MN. On October 14, 1925, a daughter was born to Floyd and Neva (Nichtern) Tresler in Graettinger, Iowa. She graduated from Quimby High School in 1944. She worked as a bookkeeper at an electric company in St. James, MN. In the spring of 1949, Darlene met the love of her life, Neal Goodwin, and they were married October 2 in Madelia, MN. They farmed near Windom, MN before moving to Osakis, MN, where Neal’s parents had purchased the Sunset Resort on Lake Osakis. Here they bought a 200 acre farm and later began Goodwin Livestock; a feeder pig and cattle business. Their sales area included Minnesota, North and South Dakota, Iowa, and parts of Wisconsin. Darlene helped on the farm, did all of the company’s bookkeeping work and raised four children, Steve, Mark, Diane and Terry. Darlene was a wonderful seamstress and made most of the children’s clothes. The Goodwins continued to make steady improvements to the farm over the years, and after running a successful business and farm retired in 1999. They moved to a cabin on Lake Osakis and spent more time enjoying their favorite past time, fishing; in Minnesota and Canada, Alaska and Texas. During the winter months they traveled across the southern states in their recreational vehicle, eventually settling at Snow to Sun Park in Weslaco, TX, where they enjoyed many winters. After Neal’s death in 2007, Darlene moved to Windmill Ponds in Alexandria and returned to Osakis to live at the Galeon in 2016. Darlene was always involved in their church and enjoyed helping as a Bible School teacher. She loved to bake and was famous for her delicious chocolate cakes and cookies. Darlene enjoyed singing, playing piano, painting and craft projects. She and Neal liked to socialize, go dancing or just entertain friends and family at their home. Darlene’s easy going, happy personality endeared her to all she knew. She was a very proud grandmother who especially enjoyed being with her grandchildren. Darlene will live on in the hearts of her family, especially her children, Steve (Eileen) Goodwin of Eagle Bend, Mark (Lisa) Goodwin of Black Hawk, SD, Diane (Dale) Johnson of Cummings, ND and Terry (Joan) Goodwin of Carlos, MN; 6 grandchildren; 14 great grandchildren; and a sister, Margaret Ash of Tuscon, AZ. Preceding her in death are her parents, her husband, Neal; a great granddaughter, Emma Goodwin, and siblings, Joyce St. John and Ronald Tresler. Funeral services for Darlene will take place on Wednesday, January 23 at 10:30 am at New Life Christian Church in Alexandria with Pastor John Taplin officiating. A gathering time will begin one hour before the service. Music will be provided by soloists Ryan Johnson and Wayne Claassen, Dennis Strong, song leader Sue Ronning, and accompanied by Missy Hansen. After a luncheon in the fellowship hall, interment will take place at the Pleasant Mound Cemetery in rural Carlos, MN. Pallbearers are her six grandchildren, Corey Goodwin, Brooke Schmitt, Tania Ruckheim, Brent Goodwin, Christina Goodwin and Ryan Johnson. Honorary pallbearers are her 14 great grandchildren.